It was drizzling as 15 club members met at Riccarton Inn, so it really felt like autumn. 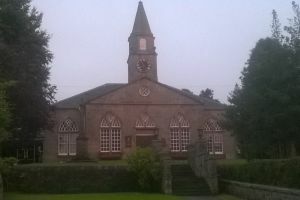 Previous runs from here have been along the Water of Leith, but Mark Kassyk had produced a map with various options down to the Riccarton campus of Heriot-Watt University. The biggest group (of about half a dozen people) went on a longer route and the rest split up into smaller groups, each choosing their own variations. Between us we probably covered all the options that Mark had suggested and one person opted for the Water of Leith direction. Not only did the weather improve, so we didn't get wet whilst we were out, but we were treated to a gorgeous orangy-pink sunset. We were joined by another 4 more members for the food, drink and chat part of the evening. Most people opted for a meal but there were options for those who preferred something less. Despite some initial confusion over the menu (because the website had not been updated) the new menu was well received. So a convivial evening was had by all. We hope that Terry Johnstone got home safely, having just realised what was causing the grinding noises he'd been hearing from his bike - part of the frame had cracked! Thanks to Ewart Scott for the photos. 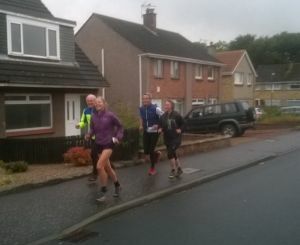 The smiles of some of the runners on one photo shows that the weather did not dampen their spirits. 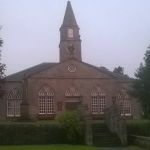 The other photo is of the lovely Currie Kirk.